"When I was a teenager, Jim Brosnan’s The Long Season changed the way I looked at baseball, but over the years I tended to read books by players and managers as studies in self-interest. Doug Glanville’s book is different. 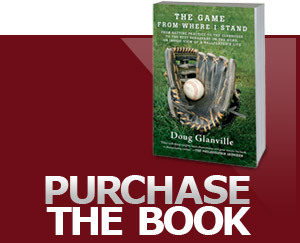 The Game from Where I Stand is an honest, thoughtful, and insightful perspective on baseball, and Glanville’s unadulterated respect for the sport and its people never wavers. This isn’t good, it is brilliant."